So I will still be producing this little newsletter four times a year. I considered changing the title - to something that would match my new 'Surimono Albums' - but decided against it; I like the name 'Hyakunin Issho' very much, and I also wanted to maintain a feeling of continuity with my previous work. And anyway, that title still matches perfectly the concept of what this is all about - me and a bunch of people learning about woodblock prints together! As you can see though, the design of this front page has changed slightly. As my work is now going to be based on unique sets of ten prints each year, instead of a larger group of 100, it is finally time to 'retire' all those little circles. Instead, you will see a tiny 'vignette' from each print as it is finished during the year. For the 10th and final exhibition of the Hyakunin Isshu Hanga Series I made a couple of changes in the 'routine' - I expanded the show from six days to nine, and I moved it up two weeks to be closer to the New Year. After having so much trouble with snow in recent years, I hoped that being just that little bit earlier would save me from being hit by the weather, and my guess was bang on - during the entire nine days we enjoyed glorious sunshine. The switch from six days to nine, even though it increased the cost of the gallery rental from the usual 600,000 up to 900,000 yen, also turned out to be well worth it. 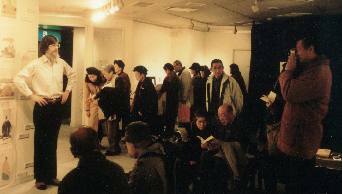 The room was constantly full of visitors, sometimes even too many to view the prints comfortably. If I had stayed with six days, it would have been far too crowded. 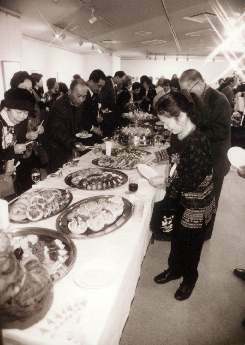 Up until about a month before the exhibition, I had been a bit concerned about how the attendance would be. The early response to my publicity material had been a bit disappointing, and I was afraid that the media had perhaps had enough of me over the past years. But in the weeks leading up to the show, I received any number of requests for interviews and appearances, and enjoyed excellent coverage in almost all of the major newspapers. Just as it did last year, NHK seems to have provided me with the most influential coverage - a short spot I did on their 'Shutoken Network' TV news program was responsible for bringing in hundreds of visitors. I had a great time during the nine days. I'm happy to get such a good chance to talk about my work and printmaking in general, and it doesn't seem to matter much to me whether or not each question has been asked a hundred times before - I'm still eager to explain things to people ... Most visitors were of course interested in looking at the 100 Hyakunin Isshu prints that were up there on the wall, but for me, the part of the exhibition that was far more interesting (I've seen all those 100 prints!) was the little 'room' that I prepared at the back of the gallery. In here, where the main lights were turned off, with the only illumination coming from behind a small shoji screen, was a sample print that showed the kind of thing I am planning for my new series - the Surimono Albums. Under the soft and delicate light, it was easy for the visitors to see what woodblock prints really look like - how their beauty comes from the combination of delicate pigments and soft and fluffy washi. I especially enjoyed standing just outside the entrance to the little room, and then hearing 'Oh!' from people as they entered and saw the prints. It was a great pleasure to be able to be teaching all these visitors how to look at woodblock prints - something that has been forgotten during the years that have passed since the Meiji era. When I came into the place for the party, I heard light clarinet music. 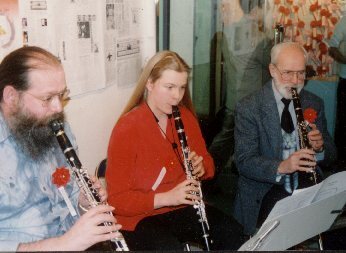 It was being played by David's father, brother and Karin, his brother's girlfriend. We always hear quiet classic music at David's exhibitions, but this time it was live by professional musicians! When it was time to begin, David looked quite nervous and was stuck for words at times. After the opening greetings, he introduced his 'backup crew', including me. We felt a little embarrassed, because our work like packing, shipping and doing translations has nothing to do with printmaking itself. But he respects the part everybody plays. After these introductions, we enjoyed eating and chatting together. At intervals, David introduced us to some craftsmen: Mr. Gosho, the 'baren' maker; Mr. Matsuyoshi, owner of a pigment shop; Mrs. Miyagawa, the brush maker; and Mr. & Mrs. Toda, who have made the storage cases for David's Hyakunin Isshu prints. Mr. Shimano, the woodblock planer, was not able to be there, but his wife came in his place. David talked passionately about how important their work has been for him. While he was talking, he even ordered a new baren from Mr. Gosho to use in his next series! To Mr. Matsuyoshi he said, "I have good news and bad news for you. The bad news is that the size of the prints in my next series is smaller, so I won't be using as much pigment. But the good news is that I plan to create much deeper and richer colours, so I'll need to use a lot more pigment!" Gradually as he spoke, he little by little found a more comfortable way of speaking. After another music break, he started a printing demonstration using this year's New Year card - the picture of the one-eyed Daruma just being given the other eye. David dealt with the work carefully step by step, explaining the process to us. He looked really happy. At first the image was vague, but each time the paper came off the wood, the shape became clearer, and as we came to the final step we all felt, "What would the picture look like?" He talked about the excitement he feels when he lifts the paper up off the block, and we all shared his feeling a little. Then, he introduced his family. His parents came from Halifax in England. His mother looked gentle and so pleased that her son carried out this long project. His father had a kind of humourous disposition and exchanged jokes with David. David's very 'big' little brother and Karin had come from Germany. I could see that David's humourous and warm personality came from this family. And of course Himi and Fumi were there from Canada. When they left Japan, they still had child-like faces, but now they looked like grown-ups - and very pretty. 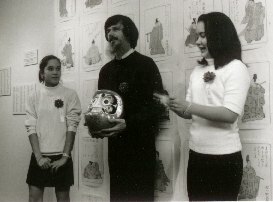 At the exhibition, they worked as good assistants and we could see that they have actually become adults. "We don't live together, but we communicate through e-mail, fax and so on. We are a family." ---- Yes, the bonds of their hearts are tied firmly. Well, finally it was time to paint in the other eye of the Daruma! Using the new brush that Mrs. Miyagawa brought for David, Himi and Fumi painted a little in turn. They left one final spot for their father, and David painted this last part black, declaring that "The long Hyakunin Isshu Series is now finished." Many memories must have come back to his heart. We also shared his feeling, and the room was full of warm applause. At the end of the party, Sadako Ishizaki, David's girlfriend, said a few closing words, telling us of something David had told her many times, "I changed my job many times. But I must complete this project by any means." After his divorce, he must have had a hard time, but he came through somehow, thanks to her. They hugged each other and thanked everyone who had been involved in this project. Sadako then told us, "There is a small gift from David for each person or group who has attended this evening's party." It was a sample of one of his new surimono prints - the picture of a sunrise and a black bird that had been in one corner of the gallery. On the display copy, there had been a small sign that said, not "Please don't touch", as we usually see in museums, but "Please hold it in your hand and look at it to your heart's content". When I held it under the soft light, white clouds emerged around the red sun ... We guests can now enjoy that beautiful picture in our own home anytime. It was the best gift! David has always told us, "It's thanks to many people's support that I can do my work." And at this wonderful party, we could feel this connection with many people. Thank you very much, David and everyone who joined the party. This is the 35th issue of 'Hyakunin Issho', and as you have already seen, the cover design has changed. The 100 little numbers have gone, and have been replaced by ten empty circles. These circles will gradually fill up during the course of this coming year, as the ten prints of my new series are finished one by one. Yes, after completing that ten year project, this next set of prints will only take one year! About a year ago, when the end of my 'One Hundred Poets' woodblock print series started to come closer, many ideas for future work presented themselves to me; there are many thousands of beautiful prints and books preserved in the museums of the world, just waiting to be brought to life again. The problem for me was not one of finding something to do, but of choosing among so many attractive alternatives. I browsed through volume after volume of print illustrations and various history books, and although I saw many beautiful prints, over and over again I found myself coming back to the surimono prints that I saw. Surimono are a 'sub category' of traditional Japanese woodblock prints. Unlike the more famous ukiyo-e, which were produced with the intention of being distributed as widely as possible, surimono were privately published works, used for gifts or sometimes for making announcements, and were almost never sold to the general public. The most common type of surimono (the term translates simply as 'printed thing') were prints like the one you see illustrated here, containing a blend of image and poetry, usually of the kyoka type. Such prints were commissioned by the poets themselves, and were exchanged among the members of their poetry 'circle'. Because no commercial motives were involved, purely artistic factors were allowed to dominate economics in their manufacture. The finest papers and pigments were used, top rank craftsmen were commissioned to do the carving and printing, and the best artists were asked to produce the designs. Surimono were usually fairly small in size, with 19 x 21.5 cm being the most common dimension. They came into being in about the 1760's, and lasted some hundred years or so. 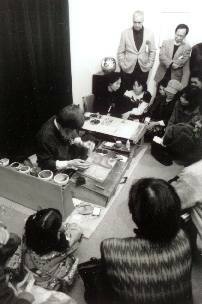 Most of the well-known artists of the day were asked to design surimono at one time or another, and some men specialized in the work. 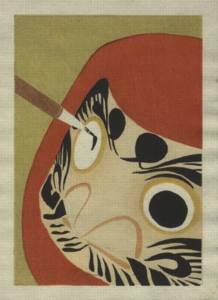 Many different themes were used for surimono imagery, among which historical events, scenes from nature, 'still-life', and the kabuki theatre were the most common. As I looked at the book illustrations of surimono prints, and saw the fine carving, the indescribably delicate printing - I knew that here was my next theme. For ten years I have been making prints all designed by one person, all depicting one theme - the Hyakunin Isshu. But I realized that my next project did not have to be quite so limited - my new theme could be the beauty of woodblock prints themselves! I could use my skills to make prints like this - to show as many people as possible just how incredibly beautiful woodblock prints can be. I could create a new definition for the word surimono - retaining the original concept of prints of indescribable beauty and delicacy, but broadening the idea somewhat, to include such illustrations as book pages and other images that hadn't originally been privately published prints. I started to gather clippings and notes about those prints that seemed particularly attractive to me, and soon discovered that the pile grew very rapidly. The only common thread among the prints in this 'collection', was that I personally found them attractive. There was no other underlying theme or link between them. Some were simple and fairly straightforward, others were more complex and would need a very high level of skill to reproduce. I picked out ten that most attracted me, laid them out in a row, and thought about the idea ... the idea of publishing my own album of surimono. I could make one each month, just the same as I had done during the years of the poets series, and could send them out to print lovers and collectors one by one as they were finished (with a storage case for the set sent along with the first print). And of course I would continue the practice of having an annual exhibition each January to show my work. The surimono of the 18th and 19th century reached astonishing heights of beauty. Since those days, the genre has been 'asleep', but perhaps it yet has some life left in it. Surimono though, cannot be made on a 'get it done, and get it out the door' principle. They can only be produced by an 'amateur' - and I use that word in its original French meaning ... one who loves. I am a surimono 'amateur'. I hope you will enjoy the prints I make. Most of the filming for that documentary program on my work that was broadcast in January took place over the final couple of months of last year, and among the highlights of the filming work for me were visits to see some of the craftsmen who have been supporting my work for a long time. Two of the men we visited, carver Mr. Susumu Ito, and block planer Mr. Shimano Shintaro, I have known for many years. It is thus with a great deal of sadness that I must tell you that they have both passed away, Mr. Ito in late December, and Mr. Shimano in late January. I met Shimano-san first, on one of my earliest trips to Japan, about sixteen years ago I think. I found his address somewhere, and visited him with some trepidation, not being quite sure just how he would respond when an inexperienced foreigner appeared on his doorstep to order some woodblocks. The worry was of course misplaced, and he gladly agreed to make the blocks I wanted. Since that time, he has supplied many hundreds of blocks for me, and the Hyakunin Isshu Hanga Series could not have been produced without his assistance. Shimano-san was disappointed in me over one particular aspect of my character - in the early days of our acquaintance, he frequently suggested that I drop by so we could go out for a drink together. But I'm not much of a drinker, and sometimes find it difficult to socialize with people, so I never took him up on those offers. After a time, he gave up asking, and perhaps he felt that I was cool and unfriendly. 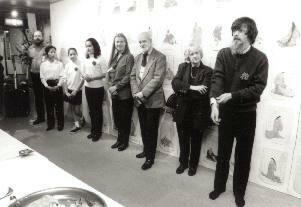 Of course, now that he is gone I very much regret my behaviour; I could have enjoyed many interesting conversations with him, and could certainly have learned a lot about traditional printmaking. Shimano-san had no apprentice, and his workshop must now be quiet and very still, the tools and heavy work bench packed away never to be used again. Dozens of men once worked in this trade, supplying woodblocks for the carvers who lived and worked all around the district. And now ... there are none. Ito-san I knew for only ten years, and during that period I was able to visit him on only a handful of occasions, five times in all I think. He was unfailingly helpful to me, offering more advice and suggestions that I could possibly take in as he talked. If you think that my prints have improved over the past decade, it is in no inconsiderable part due to his help. 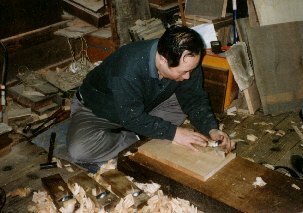 And far more valuable than his words of advice, were the chances to actually watch him carve blocks, on the three occasions I visited him in the company of TV crews. 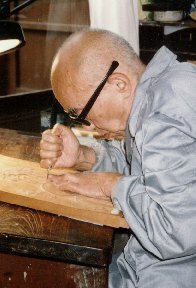 The movement of a knife through wood cannot be described properly - but in those few minutes of watching I was able to see just what real carving looked like, and each time I returned home I tried my utmost to imitate what I had seen. This was especially the case with that final visit, just a few weeks before he died. He showed me some basic techniques for 'kasure bori' (carving a dry-brush effect), and I have already started to use what he showed me in my new Surimono series. Five visits certainly isn't enough to learn all the 'secrets' of traditional woodblock carving, and I now very much regret not being a bit more assertive in asking Ito-san to spend time with me. But he was always so busy ... Busy carving blocks, blocks that were then used to make prints, prints which now no doubt grace collections all over the world. The scale of his legacy is uncountable - thousands and thousands of prints must have been pulled (and will continue to be pulled) from his blocks. And here inside the mind of this Canadian will forever live the image of that gentle little man, hunched over his bench peering closely at the block in front of him. It is now too late to thank these gentlemen for their advice and assistance, but I know that they both knew how much I appreciated their help. I hope I can carry a little bit of their history and spirit just a bit further into the future. These past few months have been quite a time for me. Putting the final colour on the final copy of the Hyakunin Isshu Hanga Series was of course the main 'event', but there was so much more ... Having my family gathered here with me ... holding the big final exhibition ... having that one-hour documentary program airing on TV ... of course the visit to the Imperial Palace for the poetry ceremony ... I think that in years to come, when I look back on these few months, I will be hard pressed to believe that it all really happened. So the work continues ... I get up every morning, grab a bowl of cereal, and check to see what is in my internet mailbox. When that is done, it's into the workroom to get busy with the carving or printing. That work then proceeds during the day, interrupted now and then by other peripheral jobs - paperwork, ordering supplies, dealing with the collectors, etc. Then, in late evening when I'm too tired to continue, it's time to crawl back into the futon ... Am I crazy, to live this way? If a company owner tried to force his employees to work like this, he would be in big trouble! But of course I'm not working ... I'm playing ... and I guess that makes all the difference.